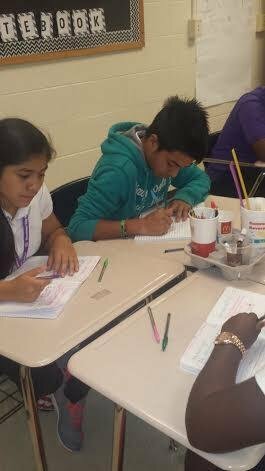 Bessemer City Middle School: Highlights - Interactive Math Notebooks!! Student Engagement! Interactive Math Notebooks!! Student Engagement! Our Mathematics Department decided to incorporate Interactive Math Notebooks this year. Interactive notebooks affords the students an opportunity to organize notes while engaging in student learning. Some examples include: foldables, graphic organizers, & small books. Students are really enjoy this activity because it allows them to have ownership and taking an active part in their learning. Also, it will serve as a tool that they can use next year!! 2018-19 Lady Tigers Scantron Testing April 8th Check in and Check out times Book Bags, Uniform, and School ID Policy PBS in the hallway! Our Students Rock!!!! Interactive Math Notebooks!! Student Engagement! SCHOOL IDS and LOCKERS Positive Behavior Support-The 3 R's-Respectful, Responsible, and Resourceful! TEN WAYS TO IMPROVE YOUR GRADES! Homework Helpline!